MazdaPros offers scheduled maintenance, extended warranty service, fleet services and 6 mo. or 12 mo. 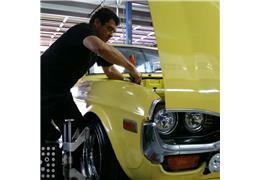 interest free FINANCING* for maintenance or repairs of any make or model. We are an Idemitsu Authorized Dealer located at our new and improved site at 5900 Rodman Street, Hollywood, FL 33023. Please call us to schedule an appointment at (954) 364-4344, we are here to serve you. ASE Master Mechanic & Owner. for event updates and information.